Winter Wish List | Runner. Writer. Renegade. I should preface this post with this statement: I am a planner. This means I’ve already started my holiday shopping, not because I like it or because I’m one of those people who loves the holidays so much that I have a Christmas CD in my car. Just because I like planning. And I hate crowds. And I hate “shopping” for gifts. No. You come up with a gift idea, then you execute purchasing it. You do not wander aimlessly around countless stores waiting for something to pop out at you. That’s hell. Okay. Now that I have that off my chest. I started collecting some ideas for my list today, primarily some goodies I want from New Balance since that’s my benevolent sponsor (sort of, I run for the New Balance Louisville racing team). Beacon pullover — winter running means inevitably running in the dark. This top is sweet. Heat En Route Jacket — I like this so much that I bought it a month ago. I wear it daily. Including to work … with dress clothes. Draped Layer Top — this will be a great gym cover-up or post-run top. 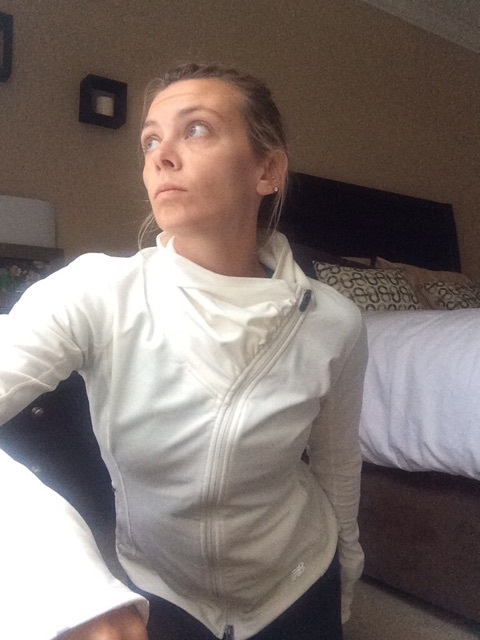 Windcheater vest — I only have one vest I like and it’s by another brand and kind of heavy. I wish this one didn’t have a hood but the color is fun. I don’t believe in dark-colored tops for winter, so the black option on this vest doesn’t interest me. So much of the day is dark that I figure winter tops — and bottoms when possible — should help keep me from getting hit by a car. Accelerate long sleeve — nice basic running top. Great by itself, but can also layer and be a go-to piece from November through February. Add a tank underneath and/or a vest over top and you’re set for most of the season. Premium Performance Tight — okay, the ankle shirring and teal color sold me. And, like with my capris, I need to replace some lighter-weight tights before mine are old enough to start middle school. These will work for running and would also be super-cute for yoga or Pilates. Gazelle Knit Pant — not sure if these will be running or gym/warmups but I like them a lot. I like the looser fit around the thighs but tapered ankle. Honestly, I have some forever-old Sporthill pants cut like that and I love them. Plus you can throw on some fitted shorts (or bun toasters) under them for extra warmth. Accelerate capri — this is a really basic capri that will mostly be a gym pant, so I don’t need anything too performance-oriented. I realized that three of my four pairs of capri date to 2008 (embarrassing AND gross) so it is time to do some replacing. Since I need to get a few pairs, this less-expensive option is perfect for Pilates, yoga, strength training, etc. I anticipate it’ll be fine for running, too, but I might opt for something like the Beacon Capri or the Impact Capri for running. Accelerate fitted short and 2.5 inch short — these are my go-to shorts. I have three pairs of the fitted ones but I bought them when I was a little, ahem, sturdier and they’re kind of loose around my legs now. Ladies, this is a longer fitted short — not those damn hot shorts that don’t cover the fattest part of your thigh. The 2.5 inch comes in lots of cute colors including some polka-dot options. My other favorite short is the Impact 3-inch, but I don’t like any of the current colors. NB 711 Heathered — Because a girl needs some cool kicks for casual days! Do you have your eyes on some fall apparel? Share in the comments! I totally agree with this. Also, my boyfriend’s birthday is a few days after Christmas, so I start planning gifts for both in July! I will have to check those out — I have a pair of regular iPhone buds with YurBuds on them. You can tell your BF that I feel his pain. One side of my family is Dec. 13, Dec. 18, Dec. 21 and Dec. 31. It didn’t take long before we just gave up. That’s insane!!! That is so many December bdays.